Silver Chatter: Which Pattern Should I Select? Which Pattern Should I Select? The selection of a sterling flatware pattern can be a tough decision. So we thought we would give you some points to consider, trying to add some logic and order to what is otherwise an emotional, and sometimes irrational, decision process. We're going to focus on the new bride. We realize that pattern selections are made by people in other situations but we think the vast majority of pattern selections are made during the time leading up to a wedding. So, here's our list of points to ponder when considering a pattern. They start out with pragmatic considerations, then moving toward more abstract thoughts. Is the pattern still being manufactured? A "yes" is not required absolutely because many patterns are available in the secondary market but it's nice to know you can buy new pieces if you like. You may actually enjoy the challenge of finding discontinued pieces. Is there a robust secondary market for used pieces? Because costs keep rising, more and more people are purchasing used pieces in good condition. It makes sense financially. A good place to check is eBay. Search for pieces being offered in the pattern you're considering. A robust market would be indicated if you see more than 200 individual listings. For example, it's common to see more than 500 listings for Gorham Chantilly pieces. A robust market could be a negative indicator for you personally if you are someone who likes to own unique things. You will not be unique if you select Chantilly as your pattern. What's the price for new and used pieces relative to other patterns? If you plan to collect place settings for 16 with 8 pieces per setting, expensive patterns could be a burden. Of course, you are also affecting the pocketbooks of people who might give you pieces. What pattern does Grandma have? Are you likely to inherit her flatware? If you don't like Grandma's pattern, forget this point. Does tarnish drive you crazy? 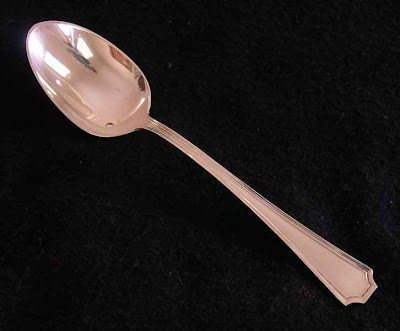 Look at the Gorham Buttercup spoon below. Tarnish will accumulate deep within the design and many Buttercup owners think it actually enhances the outline of the pattern. We agree. There is a nicer term for this called, "French gray". Would you agree or would you be constantly trying to remove the tarnish from the crevices? If the latter is the case, Buttercup probably is not for you. How does the pattern look sitting beside your dishes? How does it relate to the size, style and furnishings of your home, especially the dining area? Are you Bauhaus or Baroque? Is the pattern heavy and intricate or does it have relatively clean lines? Do you plan to use your sterling flatware every day or only on very special occasions? Does the pattern add special value? Does it remind you of family dinners past? Does it take you somewhere - New Orleans or Boston or Paris? What pattern does your fiance's ex-girlfriend have? You might want something else! The bottom line question is, "Is it you?" Does it relate to your taste in other areas? Does it already feel familiar to you? Will you value it for years to come? Your pattern will be part of your "signature". Look at the two spoons in the pictures below. You may not be inclined to select either as your pattern but you will be drawn to one more than the other. Maybe that will help reduce the number of choices you are considering. Comments from others are welcome. Click on any picture to see a larger version. By clicking on "Comments/Questions" below, you can see posted comments and add your own questions and comments. Or, you can send us an email by clicking on "View My Complete Profile" in the right column. Why Do My Stainless Steel Knife Blades Pit? 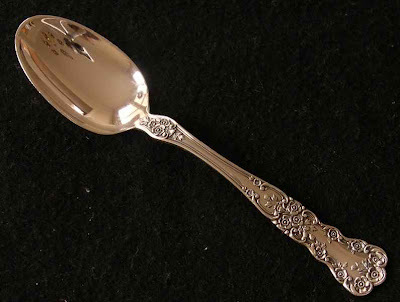 Do Used Silverplate Pieces Have Any Value?